NAVER and NAVER LABS to Demo Advanced AI, Robotics Technologies at CES and the Pepcom Digital Experience! 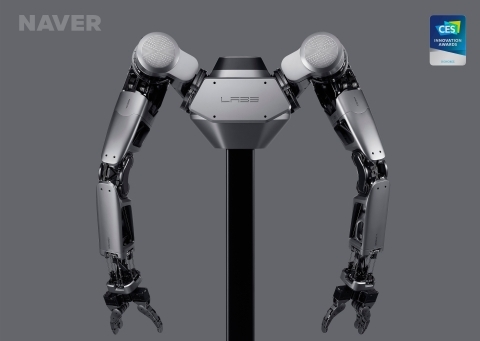 LAS VEGAS--(BUSINESS WIRE)--CES 2019 -- NAVER LABS, a subsidiary of NAVER Corporation based in South Korea, today announced the global debut and demonstrations of AI, robotics, computer-aided vision, mapping and other core technologies of its breakthrough xDM platform at CES and the Pepcom Digital Experience!. NAVER and NAVER LABS invite CES attendees to see the future of location-based services and information at the Pepcom Digital Experience! on Jan. 7, 2019, at the Mirage Hotel, and at its CES Tech East Booth: LVCC, Central Plaza - CP-14, Jan. 8-11. AROUND G — an autonomous guide robot that provides guidance in large indoor spaces such as shopping malls, airports and hotels, and provides intuitive information through AR navigation. High-precision indoor maps, visual and sensor localization are all serviced over the xDM platform to provide accurate location sensing and to guide users to their destination via the best route. AMBIDEX — a robot arm that uses innovative cable-driven mechanisms that make any interaction with humans safe. At just 2.6 kg, it weighs less than the average arm of a male adult. AMBIDEX can be operated at a maximum speed of 5 m/s and is capable of carrying up to 3 kg. AMBIDEX supports high-speed, wireless, real-time control from remote locations using the low latency and high throughput of 5G networks. Hybrid HD map & R1 — based on NAVER LABS’ autonomous driving and 3D/HD mapping technology, these are mapping solutions that combine aerial images and mobile mapping and extract information from road surfaces. The lightweight mobile mapping system R1 generates HD maps from point clouds while autonomously on the move. Compared to HD maps obtained with expensive mobile mapping systems, this hybrid HD map solution maintains high accuracy at lower cost. ADAS CAM — a camera incorporating a suite of ADAS (Advanced Driver Assistance Systems) functions based on deep learning algorithms. The system relies on only a single camera for forward-collision warning (FCW) and lane-departure warning (LDW). In addition, the integration of hybrid HD maps on the xDM platform enables functions of higher precision even in complex environments. ADAS camera modules developed in-house accurately gauge road conditions in a variety of circumstances with high dynamic range (HDR) and flicker-free functionality. AHEAD — a 3D AR head-up display (HUD) for vehicles. Most HUDs can be distracting for drivers due to the different focal distance between the virtual images and their actual view. Through 3D optical technology, the virtual images projected by AHEAD appear to exist on the road, allowing drivers to effortlessly perceive information. Founded in 1999, NAVER Corporation is a multi-billion-dollar company that is the largest internet company in South Korea with a 73 percent share of that country’s search engine market. Since its beginning, NAVER has continually developed technologies and applications that help people connect with each other and get the information they need no matter where they are or what they’re doing. NAVER established NAVER LABS for internal R&D in 2013, and NAVER acquired Xerox’s Research Centre Europe in 2017 to bolster its capabilities. NAVER LABS’ vision is to leverage xDM to provide “Ambient Intelligence” by understanding users’ environments and then providing the information and services that users need before they are requested. NAVER LABS has created service robots, automated mapping services, computer-aided vision systems and other projects to demonstrate the power of its xDM platform. NAVER Corporation is the largest internet company in South Korea with a 73 percent market share. Since its founding in 1999, NAVER has pursued a mission of connecting people and information that enriches lives. NAVER provides a range of information and communications services, including LINE, SNOW, BAND, and PAPAGO, throughout Asia and is now developing advanced applications through its NAVER LABS subsidiary. NAVER is shaping an interconnected world where people meet one another, networks encounter networks and where today intertwines with tomorrow. In 2018, NAVER was ranked as the world’s ninth most innovative company by Forbes and was listed sixth on Fortune’s Future 50 company list. NAVER LABS Corp. is NAVER's R&D subsidiary, developing future technologies in areas such as autonomous driving, robotics and artificial intelligence with the goal of achieving Ambient Intelligence. It first began as an R&D division within NAVER Corporation in 2013, and was officially established in Pangyo, South Korea in January 2017 with CEO Chang-Hyeon Song. The company expanded into Europe in 2017 with the acquisition of the Xerox Research Centre Europe in Grenoble, France. See NAVER LABS global debut of AI, robotics, computer-aided vision, mapping and xDM platform at CES and the Pepcom Digital Experience!